Since I published the article for the Vigurvant, we were then approached by the folks from Companion Bike Seats to see about testing their rear rack/bike seat. 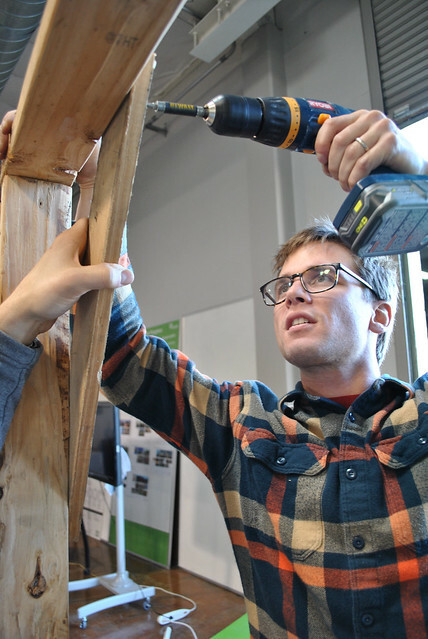 A Companion Bike Seat gives your bike many of the same features of expensive cargo bikes and utility bikes, but is easy to install and works on most existing bikes, and some ebikes and motorized bicycles as well! 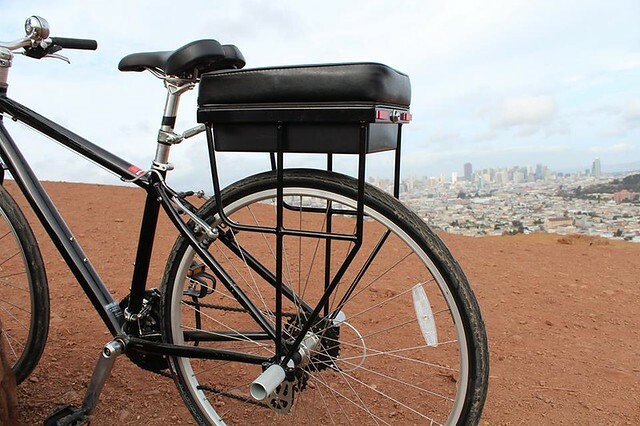 Not only is there a locking stash-box for your belongings, but Companion Bike Seats support passengers up to 200 pounds. Start a daily bike commuter “bike-pool.” Pick your kids up from school on your bike. Ride your bike to the bar instead of taking a cab, and you can still bring someone home with you! After checking out their site, I was really intrigued by the whole idea of being able to carry full grown adult and a sandwich in the storage compartment. So after a few email exchanges, Paul O’Leary agreed to send a test unit over. I’ll most likely use it with the Vigurvant pedals. It would actually make sense for both of of these companies to work together and see if they can do a combo deal.Anyhow, I’m looking forward to the Companion and we’ll report back to you on our findings. We’ve had the Jamis Hudson with Slidepad on test for a few months now, and despite a lot of frigid days, and days that look like this (or snowier), I’ve managed to get enough rides in to get a good impression. Average reviewing conditions. March 17th snow in Virginia! You’ll remember (or not) that I did an initial review here. Overall, I can’t say that my impressions have changed very much – I still think the general setup is pretty good for the intended audience, and after a decent number of hours/miles (many at slow speed with a 5-year old out in front) I didn’t have any issues crop up. The bike is overall comfortable (though after one 2-hour ride I was getting not-so-happy with the super-cushy saddle!). There is one significant difference between that initial review and now, concerning the brake setup. After reading my initial impressions, Ian at Slidepad was concerned there might be something wrong with my brake setup. He gave me a call, and we determined that the sliding-pad bit of the brake system had gotten (to use a technical phrase) hung up on something internally – so it wasn’t kicking in full-force. After wrestling with it a bit, I managed to pop it back into place without damaging anything, and voila! I had improved braking performance. So – that bit of my initial review can be revised. Braking works pretty effectively,the rear wheel does not lock up as much as it was before, and the front-wheel braking kicks in reasonably quickly. While I was talking with him, Ian also explained that their “improved braking efficiency” claim was made against a bike with rear-brake only (like a lot of the coaster-brake cruisers out there). I’d agree that this definitely beats that setup. 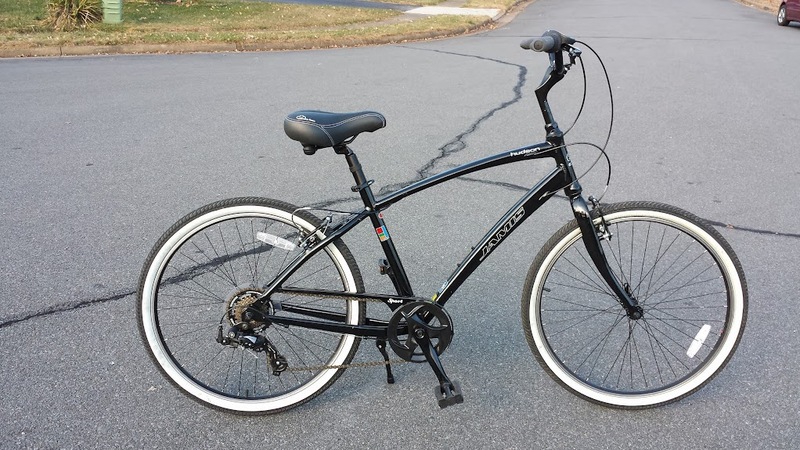 However, I think a fairer comparison is against something like the Electra Townie 7D, which is extremely comparable in price (within $20), as well as components (with the exception of the brakes) and general intent. In that case, I don’t think that there’s going to be a big difference unless the rider of the Electra isn’t using their front brake well/at all. This brings me to the whole “one brake lever is easier” thing. Yes, it works. Yes, it’s a valid option and frankly I can see it working out for some people (and hey, you have your left arm free to signal turns!). But in general – I still don’t quite buy it. When using Slidepad, it does take a bit of trial and error to adjust to the point where the front brakes kick in, as you go from a light “back only” to a significantly stronger “back and front combined.” When riding at speed, I did sometimes find myself unintentionally slowing much more than I meant to when that front brake kicked in. So in my mind, learning to deal with this isn’t really much less difficult than learning to deal with two brakes. Finally, I really think the whole risk of doing an endo/losing control by means of front brake, on a bike like this, is pretty minimal – the weight balance is so far back that it really takes a lot of effort to get the back wheel to pick up much at all. In terms of the “simpler” idea on the brakes: my experience with the whole setup having a malfunction didn’t leave me more confident. I was happy it was fixable, but it definitely took more effort than getting a regular set of V brakes set up. Additionally, it’s a lot more obvious what’s wrong with a set of V brakes. I’m sure Jamis dealers will get their mechanics all set up on how this system works – but if an owner of this type of brake system walks into a shop that hasn’t seen it before, I have no idea what their results would be. If all is working fine, it’s not going to be an issue, but I can’t say how often issues might come up. In the end, this really all comes down to personal preferences (as it so often does!). In this case, I’d prefer independent brake levers for the greater degree of control. However, if a prospective buyer is purchasing from a Jamis dealer, intends to continue to use that shop for service, and likes the whole “one hand two brakes” concept, I’d say go for it. 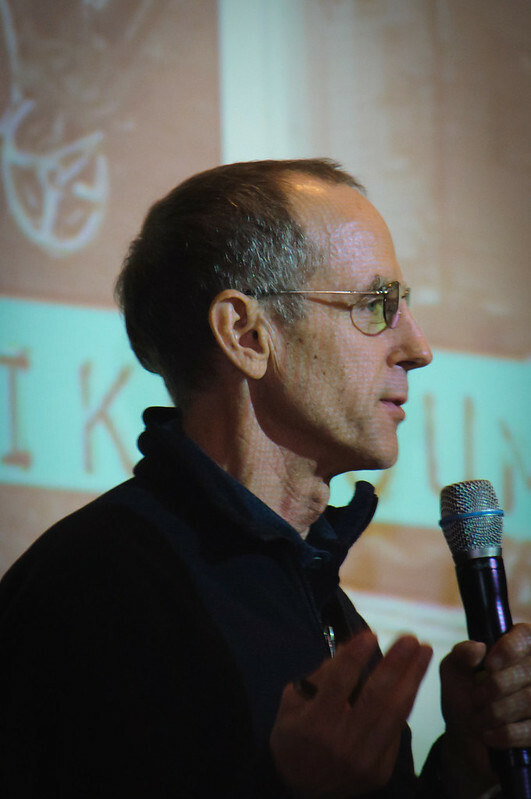 Note: We’re pleased to offer an intro to Bruce Wright, one of the leading advocates for better bicycling facilities, policies, and education in the greater Washington, D.C. area (and specifically Fairfax County, VA). Bruce’s advocacy work on the board of WABA and as chairman of FABB is very nearly a full-time job at this point, so we appreciate him taking the time to answer some questions for us! I started commuting by bike on a regular basis in 1979 and have been doing so almost daily since then (34 years). Why did you start riding your bike to work and how long is/was your commute? There were several reasons why I started to bike to work. 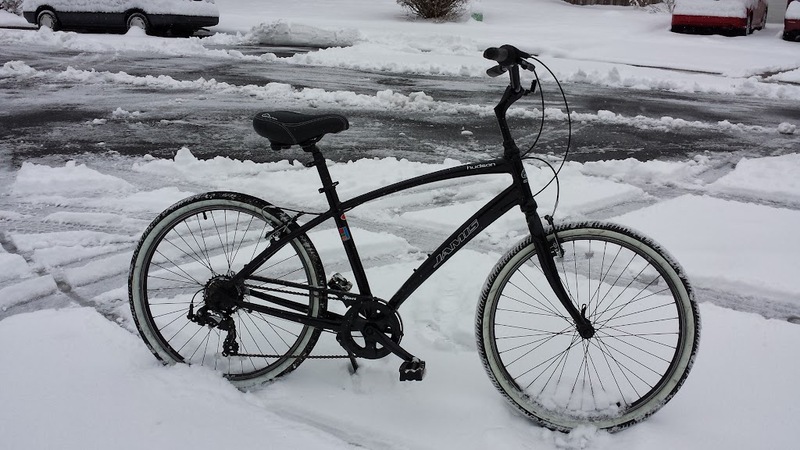 I understood the health, economic, and environmental benefits of biking and since I had a short, 3 mile commute, I decided to bike instead of buying a second car and driving. I could commute by bus when necessary, which was very rare, maybe 3 or 4 times a year. Since I retired from working full time my bike commuting to work has transformed to using a bike for almost all other local trips. I’m 64 years old and have been able to maintain the same weight as when I was in high school. I take no prescription drugs other than for minor medical procedures and usually only visit the doctor once a year for a physical. I think I’m a happier, more well-adjusted person because I get regular exercise by riding. My wife and I enjoy riding together as well. One caveat; I now use sunscreen whenever I go outside. Bike commuters are exposed to the sun more than others and we need to protect ourselves from the harmful effects of UV rays. What do you do for a living and in what city/town do you bike commute? When I worked full time I was a geographer with the U.S. Geological Survey in Reston, VA. Since I left the Survey in 1999 I’ve worked part time in several different jobs: as a legislative aide to a local politician, as a bike shop employee (at bikes@vienna), as a bicycle skills teacher, and now as the head of a local bicycle advocacy non-profit (volunteer). I’ve made a conscious decision to work in places where I can easily bike. Lately I’ve been mostly using a Brompton folding bike. It has six gears, fenders and a rack and a front carrier block that holds a large bag. The bike is great for taking on Metrorail and bus and is a fun way to get around. For longer commutes or trips where I need to haul more stuff I use a Bruce Gordon touring bike outfitted with fenders, front (occasionally) and rear rack, and large panniers. I used that bike to travel cross country in 1999. I also own a recumbent tandem that I ride with my wife, a beater bike for parking at Metro, and a short wheelbase recumbent that doesn’t get much use these days. I’ve helped many motorists who have car problems. When traveling on a bike it’s harder to pass by someone in need. Most people have never tried riding a bike to work so the concept is foreign to them. I tell them that it’s easier than they think and that they should try it one day. 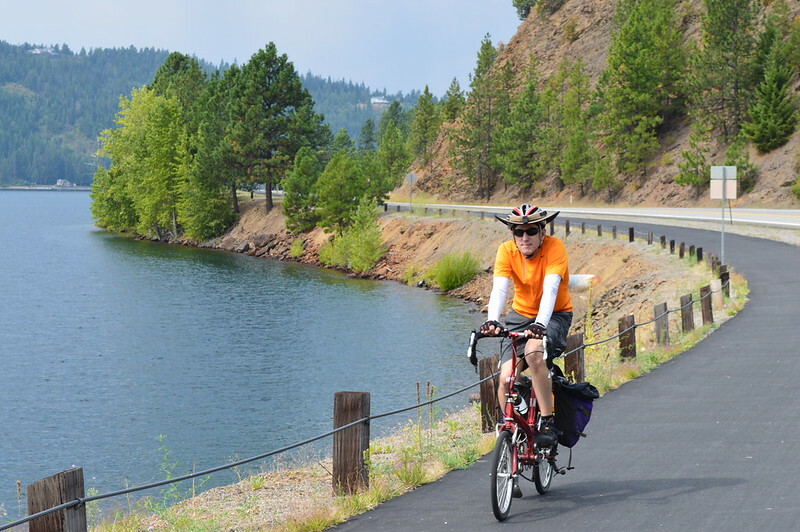 It takes a little planning but most people can easily ride farther than they think. 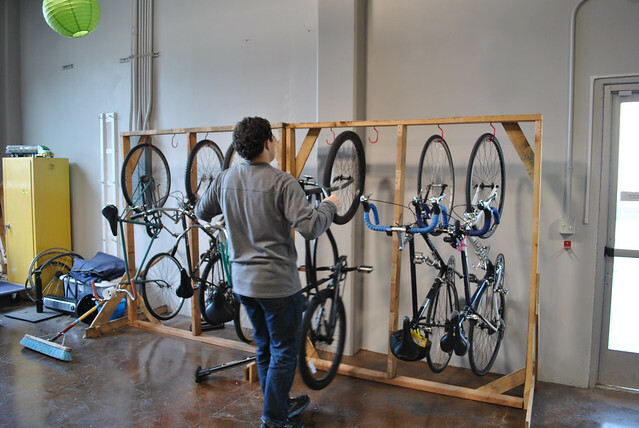 Bike to Work Day is a great time to encourage co-workers to try biking. 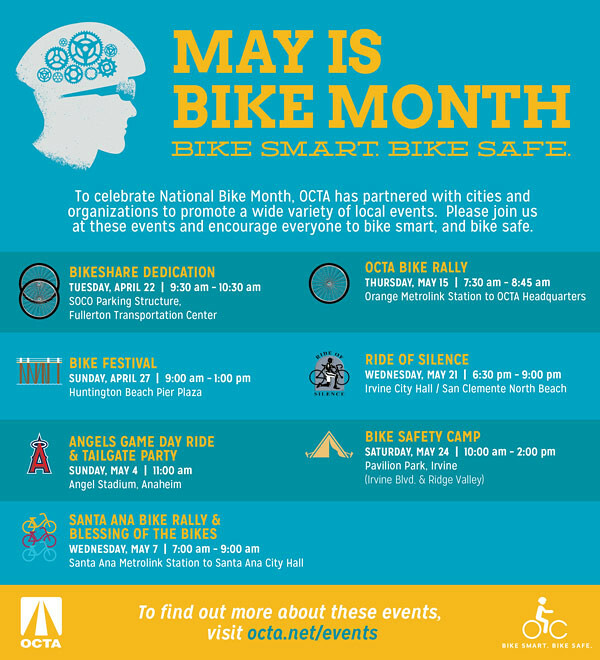 I know many people who rode for the first time on Bike to Work Day and have continued to bike commute at least some of the time since then. I’m on the Board of Directors of the Washington Area Bicyclist Association and chair of their advocacy committee. I’m also one of the founders and now chairman of Fairfax Advocates for Better Bicycling (FABB), a local volunteer non-profit advocating for better bike conditions and policies in Fairfax County, VA. I’m also a member of the League of American Bicyclists and a League Cycling Instructor. The world would be a healthier, happier place if more people took short trips by bike. 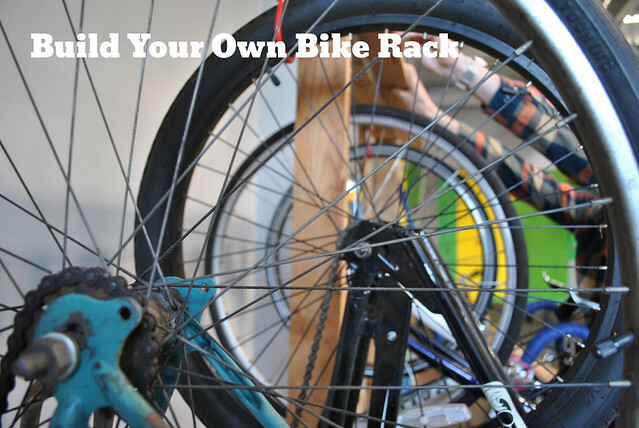 Merry Xmas Bike Commuters: DIY Bike Rack Just for YOU! 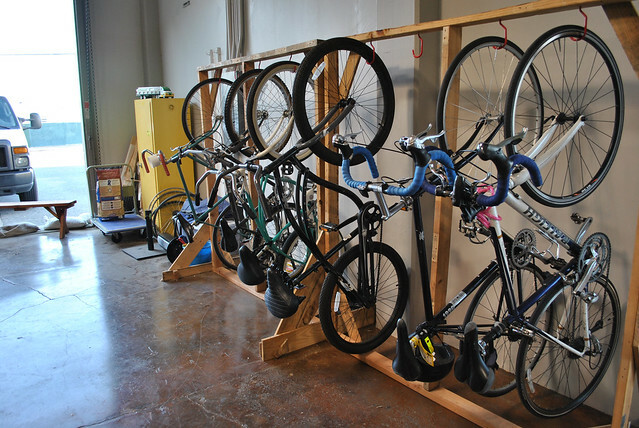 My office has a plethora of bikes that live full– or part–time in the warehouse. 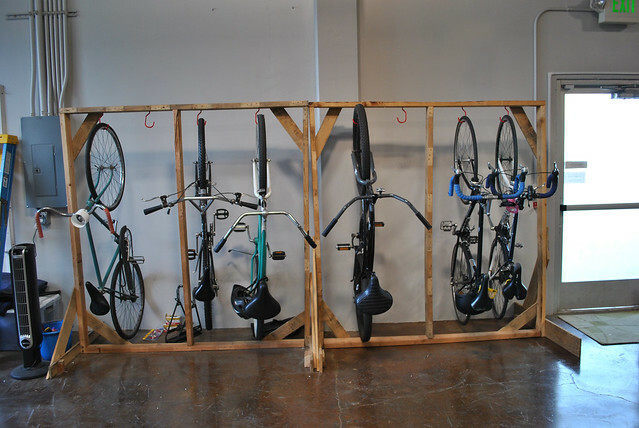 This small fleet of communal cruisers and commuter bicycles needed an organized home rather than randomly strewn about the room. 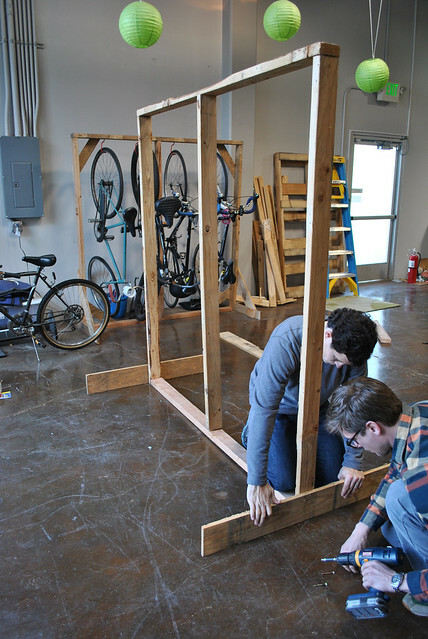 Luckily, we have a couple of industrious fellas who took on the task of building a bike rack with limited funds, two wooden pallets, and an hour to spare. 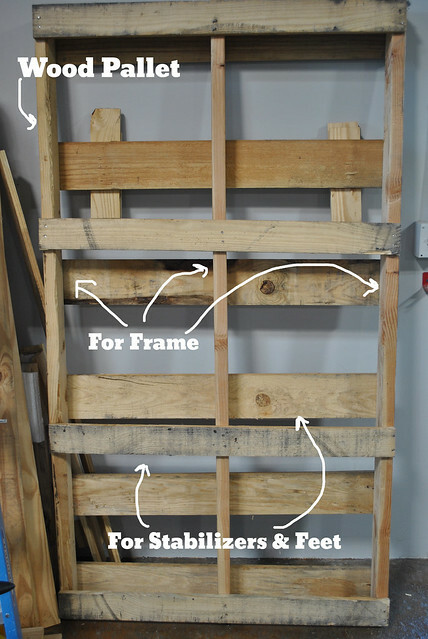 Now we’re sharing with you the step-by-step guide on how to build your own hanging bike rack. Grab a friend or two. 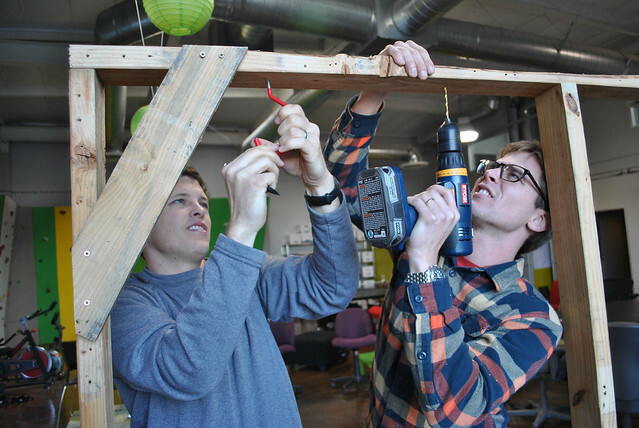 The building will be easier, safer, and more fun with a friend. 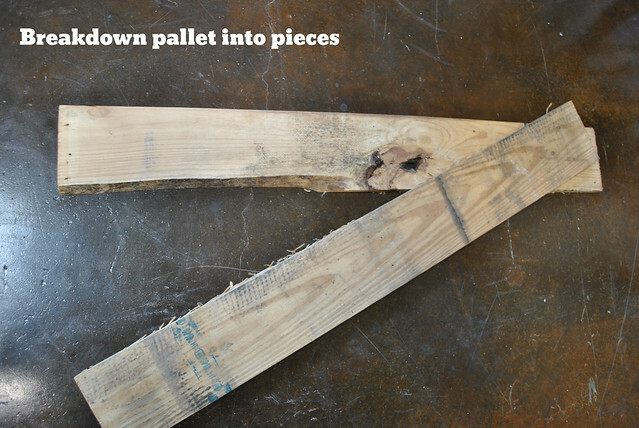 Carefully disassemble the two pallets and remove all nails––this is where the hammer comes in handy. 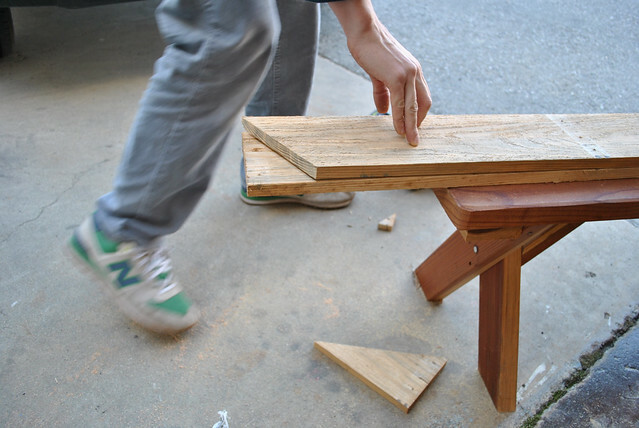 Group the pallet lumber into similarly sized pieces. 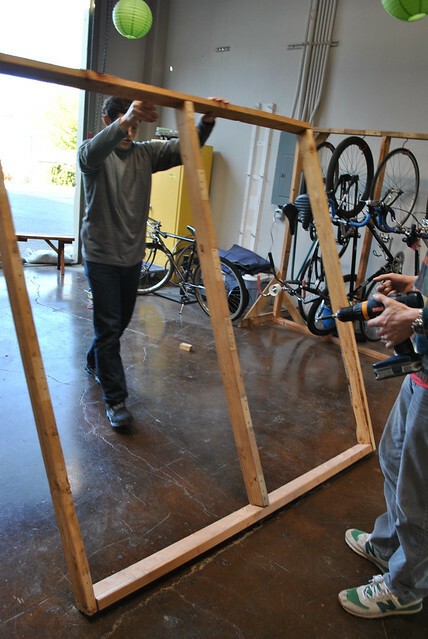 All the longest, sturdiest pieces (the 2x4s) will form the frame of the bike rack. 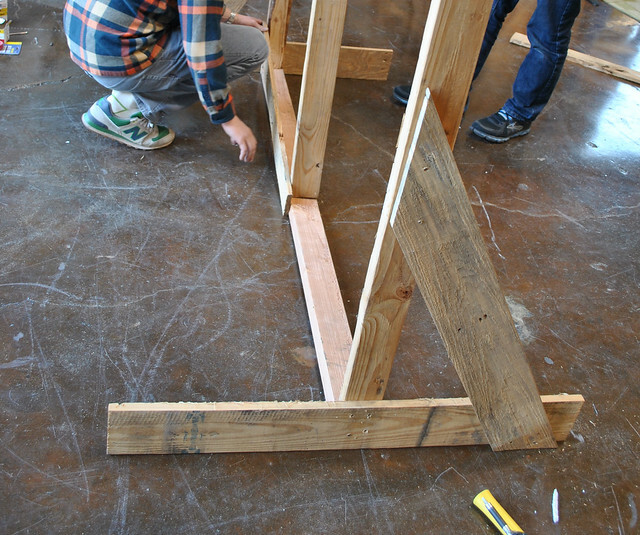 Construct the frame using five of the 2x4s. 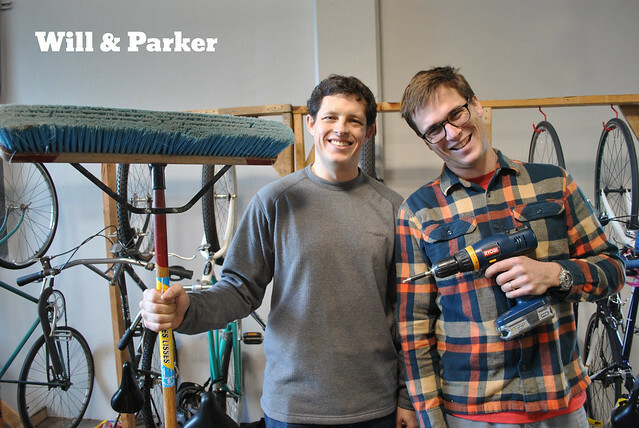 You may need to trim some of the lumber to size as Will & Parker did for our bike rack. 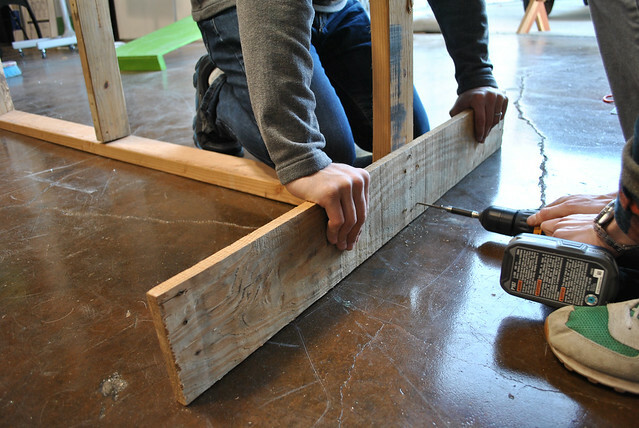 Secure each corner with two long wood screws. 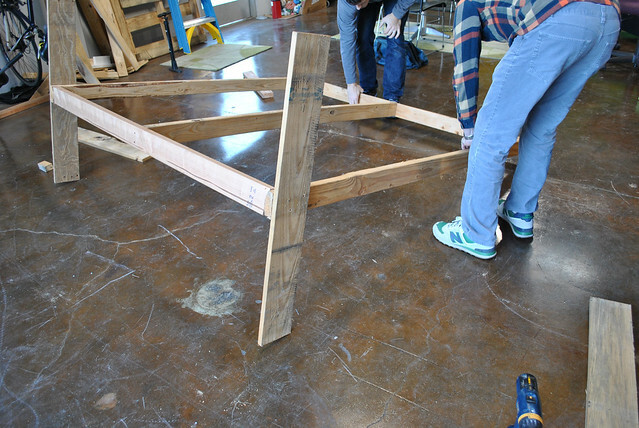 The bottom beam usually needs to be the flattest, least likely to wobble; however, the bottom beam on the rack built by Parker & Will was warped. Gotta work with what you have. You should now have a large rectangle. Place the third and remaining 2×4 directly in the middle between the two outer columns. You can see how carefully Will measures the distance using the highly-scientific “counting-his-steps” method. You may need to trim the lumber to size. Secure the middle column with two screws at either end. Give this rack some feet to stand on! 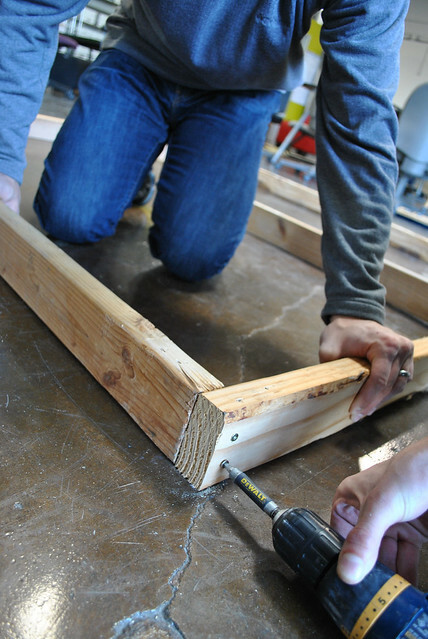 Secure a 1×6 to the base of the outer columns with four screws each. Bracer. 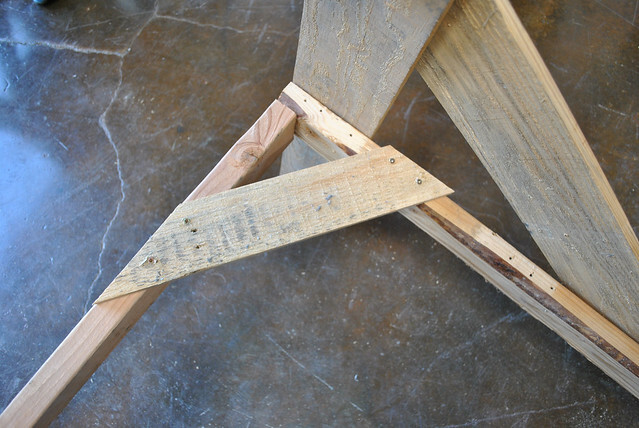 Create a stabilizer for each foot––’cause you know triangles are the strongest shape (I learned that in 3rd Grade). 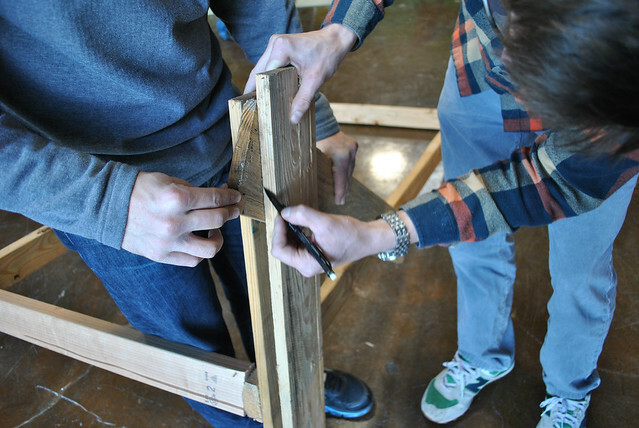 Parker identified the angle for the cut by holding the 1×6 in place and marking with his favorite mechanical pencil. Super sophisticated stuff here. 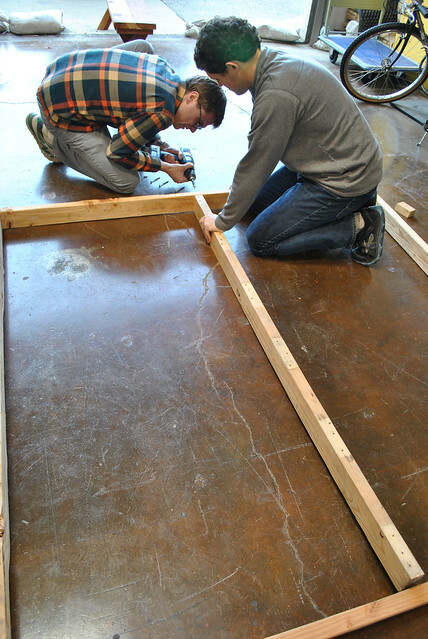 Trim each stabilizing piece along the identified angles, so that the edges are flush with the frame. 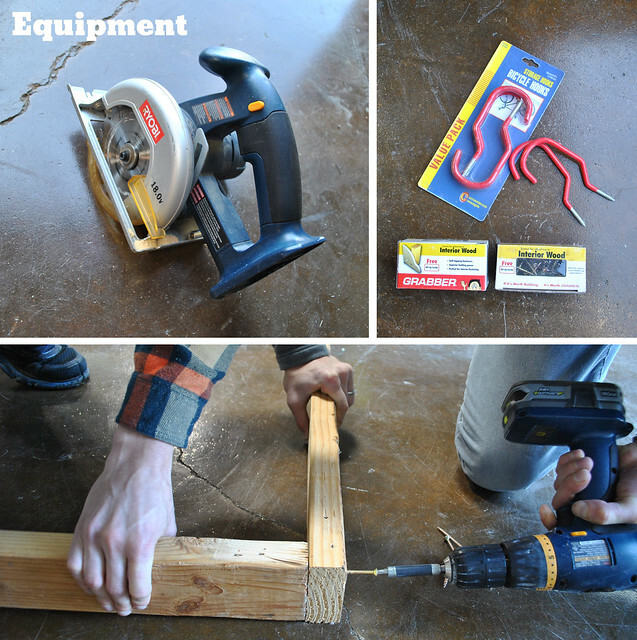 Secure each brace with a couple screws. More stabilizers! 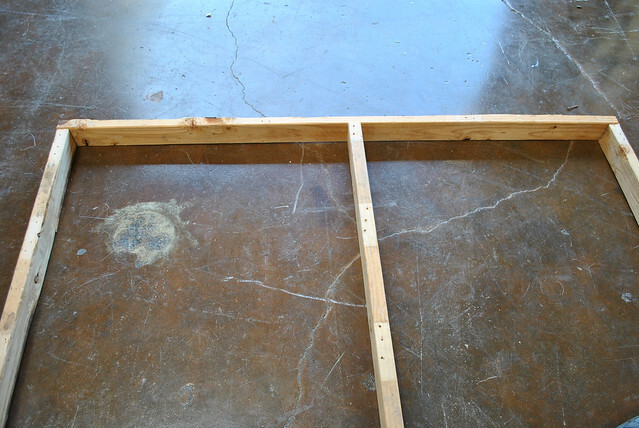 Add a small 1×4 stabilizer at each corner of frame for added stability. That’s four in total, if you’re counting. 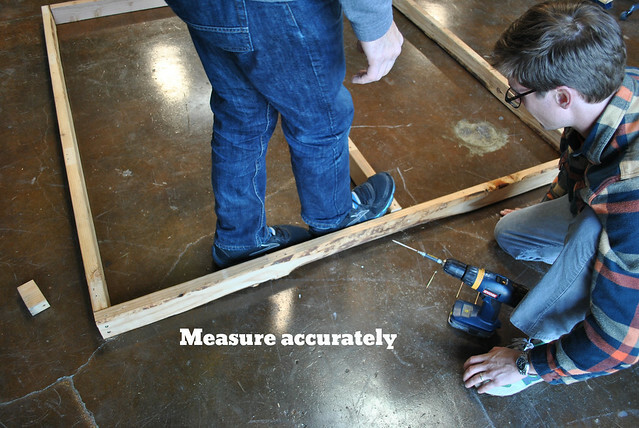 Measure and cut the smaller stabilizers using the same method in Step Five. IMPORTANT: Don’t place your stabilizers too far into the frame or they may obstruct how your bikes hang. 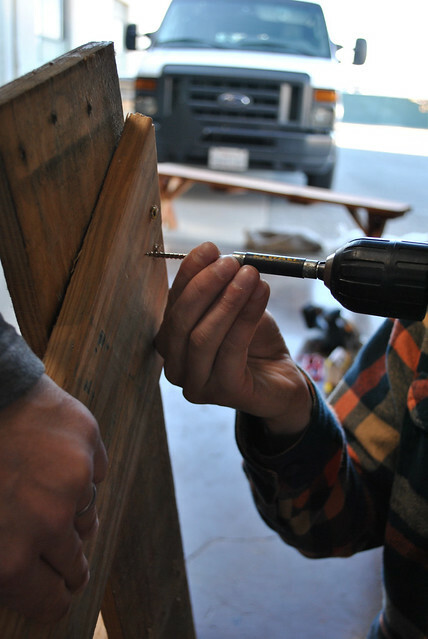 Secure with the smaller length screws. Lookin’ good! You’re almost there. Hang up yo’ bikes! Stand back and admire a job well (and economically) done.